While quite a bit of a fuss was raised regarding the kidnapping, smuggling and trafficking of Haitian children and rightly so, the same can't be said about the fate of Iraqi children. Of course, before our "liberation" such criminality involving the selling, buying, trading, kidnapping, killing of children was unheard of...am I to deduce that Freedom and Democracy are baby killers ? Am afraid so. Hussein Anwar kindly forwarded this article a couple of months ago and I have been so busy with other things and only found the time today to translate it for you. The article is dated 31.12.2009 and appeared on Al-Jazeera net. The title - Female gangs kidnap children. Al Jazeera learned through a correspondent in Baghdad, who wishes to keep his anonymity, that the rate of child kidnapping is on the rise and is being blacked out by the local and international media. 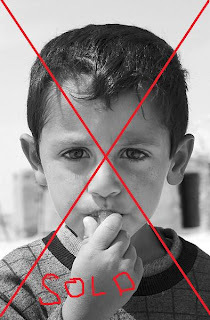 This criminal activity is taking place throughout Iraq and according to some of the figures obtained from Lieutenant Dia Sahee of the Ministry of Interior responsible for investigating such crimes : from January 1, 2009 until October 1, 2009, there has been 177 REPORTED cases of child kidnapping in different provinces excluding 72 reported cases in Baghdad alone. These criminal rings employ women because women have easier access to children, either through their working in or visiting maternities where infants are kidnapped, or through schools or domestic work, and sometimes it is through asking the child for some help or enticing him/her and then abducting them in cars, hiding them under the abaya until the kidnappers reach another province or their base. It seems that these highly organized rings have bases too. A recent case was the arrest of 4 women from Samawa, Southern Iraq, who gave some information on the methods used. Most of these children are kidnapped for a ransom, and when families do pay, they are explicitly told that if they report the case, their child will be either kidnapped again or killed. That explains why there are no official statistics - mainly because of fear of reprisal. The article quoting an Iraqi editor of a newspaper then goes on to say that it is imperative that the government pays serious attention to this and takes stringent action/measures to combat this new crime that is plaguing Iraq. The article also says that both the local and international media must cover this. Our little ones have become commodities. How can you people sleep at night with a clear conscience when you know that this is the fruit of your doing ? There are criminal rings in Baghdad that kidnap and traffic in children and you are nothing but their silent killers.